Mars is undergoing intensive, simultaneous scrutiny by the largest number of spacecraft ever to explore the red planet. While orbiters conduct sensor sweeps of the martian landscape, the Spirit and Opportunity Mars rovers continue their extraordinary surface sojourns. The flood of scientific data continues to expose the truth about Mars. But still to be nailed down: Was the planet once a home for life, perhaps even a hangout for biology today? Ground-breaking investigations are just that. Some scientists see Mars underground as breathing room for a subsurface biosphere. If true, drilling down to come up with martian life may be in order. Arriving at Mars in late December 2003, the European Space Agency's (ESA) Mars Express has been dutifully scoping out the red planet. This week, more than 200 scientists will take part in the first Mars Express science conference, to be held February 21-25 at ESA's European Space Research and Technology Centre located in Noordwijk, the Netherlands. As part of the meeting, a special session is being held on exobiology and the search for life on Mars. A quick look at the titles of papers hints that Mars Express findings should stir up new views of that time-weathered world. The prospect for still-active volcanism is to be discussed. Evidence for a frozen sea close to Mars' equator will be detailed. And the latest eye-openers from the spacecraft in scouting out methane, formaldehyde and water on the red planet are also on the program agenda. 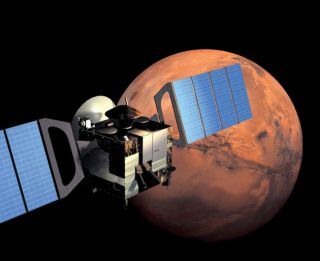 Last September, ESA released data from the Mars Express Planetary Fourier Spectrometer (PFS) showing that concentrations of water vapor and methane in the atmosphere of Mars significantly overlap. The PFS team is led by Vittorio Formisano, Head of Research, National Council for Research's Institute of Physics and Interplanetary Space in Italy. As PFS principal investigator, Formisano reported that these intensities were found in three broad equatorial regions of Mars: Arabia Terra, Elysium Planum and Arcadia-Memnonia. These particular areas of water vapor concentration reportedly matched up with subsurface water ice layers charted by NASA's Mars Odyssey spacecraft. It was reasoned that geothermal processes, feeding a subsurface ice table, might push gases like methane up to the surface. Furthermore, it was speculated that if liquid water does exist below such an ice table, bacterial life may exist there, producing methane and other gases that waft upward to the surface and into the martian atmosphere. If substantial confirmation is forthcoming that Mars' atmosphere is laced with methane, that means that something is replenishing the gas, said Penelope Boston, director of the Cave and Karst Studies Program at the New Mexico Institute of Mining and Technology in Socorro. But there are a half-dozen ways to cough up methane on Mars. The most pedestrian source would be an ultraviolet-driven reaction in the carbon dioxide-rich atmosphere that creates methane, Boston said. "A more enticing suggestion, of course, is that volcanic activity is still present on Mars," Boston said. "It would obviously be at a much lower level than in the past. There may be significant heat flow from the planet's interior...eking out gradually from deep below the surface." Boston said the "most tantalizing possibility" is the fact that on Earth a great deal of methane is biologically produced by microorganisms. "So this is what has people so revved about detecting methane on Mars," she said. Whether or not the methane has a biogenic source -- that is, produced by living organisms - remains an unknown. If localized sources of methane can be pinpointed, then it narrows down the prospect of what is the source of the gas. If it appears defuse, that would argue, in Boston's view, that the methane is a product of atmospheric chemistry. Existing missions at Mars, and those yet to fly, will be essential in confirming the methane detection. "If you had a Mars airplane or a balloon...if you had some aerial mobility...then you could constrain the search pattern," Boston advised. Having dwell time over and on Mars could help identify likely places where methane might be percolating up into the atmosphere from the subsurface. NASA's Mars Science Laboratory (MSL) -- a science-sleuthing mobile rover -- is to be launched in 2009. It will have the ability to make high sensitivity, high precision measurements of atmospheric methane. MSL's Sample Analysis at Mars (SAM) experiment makes use of both a gas chromatograph mass spectrometer and a tunable laser spectrometer. SAM can search for traces of prebiotic chemistry, or of past or present biological activity. Once on the martian surface, MSL is to explore a local region as a potential habitat for past or present life. MSL will operate under its own power - likely nuclear. It is expected to remain active on the planet for one Mars year. That's equal to two Earth years. "MSL will give us a definitive measurement via its SAM analytical suite," said James Garvin, NASA's Chief Scientist at the space agency's headquarters in Washington, D.C. SAM may be able to "nail" the provenance of any methane it detects in the near-surface atmosphere, he said. Garvin said that some at NASA feel an orbital or airborne atmospheric trace gas explorer is on the must have list "if we are to understand this enigma...and potential scientific fingerprint for volcanism or even microbial life." The PFS on Mars Express is well-suited for first order examination of some of the less abundant photochemical species on Mars, Garvin said. But that instrument's sensitivity, he continued, makes it impossible to assess provenance, "and hence we cannot tell mode of origin or source!" Methane could be the manifestation of a small amount of leaky volcanism, Garvin said, which is certainly not precluded or unrealistic on Mars. To get to the next step of the methane on Mars issue, space scientists will need to use all the tools available, Garvin advised. That includes continued PFS surveys by Mars Express, as well as data gleaned by NASA's soon-to-be-launched Mars Reconnaissance Orbiter, as well as the space agency's Phoenix lander to be dispatched to Mars in 2007. A more focused search for the sources and sinks of biogenic trace gases, and then a multi-pronged strategy to respond is a likely course of action, Garvin said. Most certainly, identifying subsurface aquifers and other important features underground will be critical, he said. One approach to probing for present life on Mars is by drilling. In fact, trial-runs of techniques and technologies are already underway here on Earth. The Mars Analog Research and Technology Experiment (MARTE) is a three-year, joint project between NASA and Spain's Center for Astrobiology. Located in southwestern Spain, the Rio Tinto is in the Iberian Pyrite Belt, a large deposit of sulfide minerals that was formed in an ancient hydrothermal system. The collaborative effort is focused on searching for and characterizing subsurface life at the Rio Tinto that might be living on chemical energy derived from sulfur and iron minerals. Moreover, the Rio Tinto work is seen as a learning experience for guiding the development of technology for drilling, sample handling and instrumentation to be used in the eventual search for subsurface life on Mars. While the work at Rio Tinto is relevant to finding life in a subsurface terrestrial environment here on Earth, the effort can't be used to infer anything about life on Mars, directly. Although the Rio Tinto work by its very nature won't tell scientists if there is life on Mars, the effort does help formulate the strategy on how to search for possible Mars life. Next month, during the 36th Lunar and Planetary Science Conference (LPSC) in Houston, Texas, MARTE members will report on a subsurface biosphere found at Rio Tinto. According to a LPSC conference abstract submitted by MARTE officials, the kind of subsurface biosphere discovered at Rio Tinto "could be living on Mars today and producing methane that, when released to the atmosphere, could potentially be a source for methane that has been observed in the Martian atmosphere by the Mars Express mission." There is a preponderance of evidence supporting the view that methane is in the Mars atmosphere, said Robert Zubrin, President of the Mars Society. "The issue is the interpretation of that methane as a signature for life." Given orbiter and recent Mars rover findings, it's now a known fact that the distant planet once had large bodies of standing water, Zubrin said. "There was liquid water on Mars for a longer period of time than it took for life to evolve on Earth." Also, add in interplanetary transfer of material at that very same epoch. "There's every reason to believe that there was life on Mars at that time," Zubrin speculated, if from no other source than the Earth...or perhaps shot from Mars to our planet. "If there had been life, then it seems quite reasonable to suppose that life could persist underground in reservoirs of water," Zubrin added. "It's virtually certain there are bodies of liquid water underground on Mars now. And there's no reason whatsoever that these environments are not fully satisfactory for microbial habitats." The methane observations could indicate the presence of life today on Mars, Zubrin told SPACE.com. That underground prospect, he said, bolsters the need to send astronauts to Mars, loaded down with drilling equipment. Zubrin envisions wildcatting explorers on Mars, setting up rigs and drilling deep to subsurface aquifers. On-the-spot study of microbes can be done, including culturing the Mars biology and carrying out biochemical testing, he said. "We've got a very strong clue here. And I think this is a very strong argument for human exploration," Zubrin said. "But we won't know until we go." Drilling on Mars via robots will be "massively difficult," concurs Boston of the New Mexico Institute of Mining and Technology concurs. "People are talking about doing it robotically, but I think it's quite the nut to crack." Boston is deep in her own studies, including a Caves of Mars Project funded by the NASA Institute for Advanced Concepts. Natural subsurface cavities, for example, present the most mission effective habitat alternative for future human missions in the high-radiation environment of Mars, she pointed out. Additionally, lava tubes, other caves, cavities, and canyon overhangs are sites of intense scientific interest. They offer easier subsurface access for direct exploration and drilling, and may provide extractable minerals, gases, and ices. One aspect of the Caves of Mars Project is to study inflatable habitat modules and foam-in-place airlock units to support explorers in their cave work. "One of the things we've learned from working in caves is that microorganisms are very sensitive. They are adaptive to the subsurface. We don't just bring them out. We culture them for weeks to months, to sometimes years. And then we bring them out in controlled-condition containers so as not to expose them to light. So try and handle that material without people...I think it would be really hard," Boston said. "There's nothing better than live specimens, period."